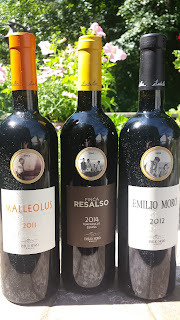 Through the power of web technology, last week I participated in a presentation by winemaker José Moro of Emilio Moro Winery on Ribera del Duero and a trio of their Tinto Fino (Tempranillo) wines. The video exchange started with Moro discussing the family history of the winery that his Grandfather Emilio Moro Sr. started almost a century ago. He selected the best sites on his land in Pesquera de Duero and grafted a unique clone of Tempranillo called Tinto Fino. This clone had several advantages which included smaller berry size and looser clusters. In 1932, Jose's Father Emilio was born and was the same year that Emilio Sr. planted the Finca Resalso vineyard. José was raised in the vineyard and the winery and in 1987-1988 he and his brother Javier, invested to create the Emilio Moro brand. Since that decision, the winery has received numerous awards and 90+ ratings. José also spent a considerable amount of time during the web meeting discussing Ribera del Duero and the family's vineyards. Today Spain consists of 70 AVAs, but in 1925, Ribera became that country's third. It has a continental climate with long cold winters; hot, dry summers; and a sharp diurnal temperature swing between summer days and nights. Ribera contains three distinct elevation zones starting with the Low Plains (up to 750 meters) leading to the Slopes (750-850m), and ending at the Plateau (850-1,600m). In fact, this Plateau region contains the highest vineyards in Spain. There are also three types of soil spread through these elevation zones. According to José Moro, the chalky soils provide elegance and complexity; the clay soils structure and character; and the stoney soils maturity and sweetness. We then moved on to sample three wines that were provided to the participants beforehand. Notice how the unique labels honor the family's history. 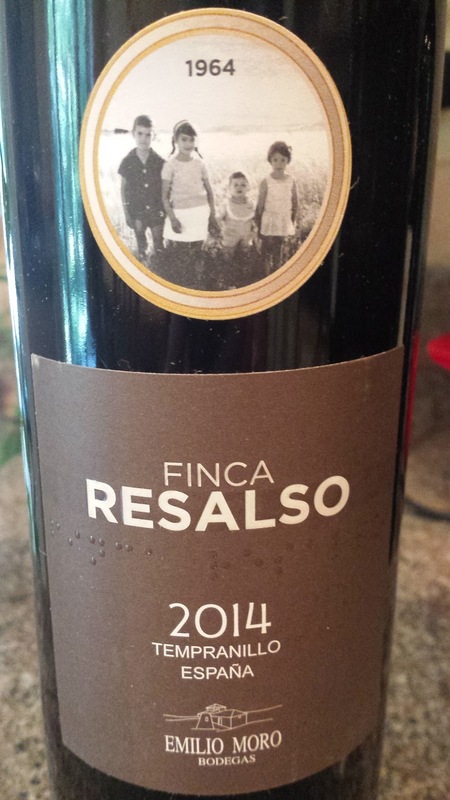 Finca Resalso 2014 ($14.99, 13.5%) - 100% Tinto Fino (Tempranillo); aged 4 months in 100% French oak barrels. Even though this wine is named after the vineyard, it is composed of grapes from younger vines (5-12 years old) planted throughout various vineyards and represents all elevations and soil types. The wine starts with ripe dark fruit aromas, some dustiness on the palate integrates with the fresh fruit; solid acids and easy tannins. Very approachable and quite the value. 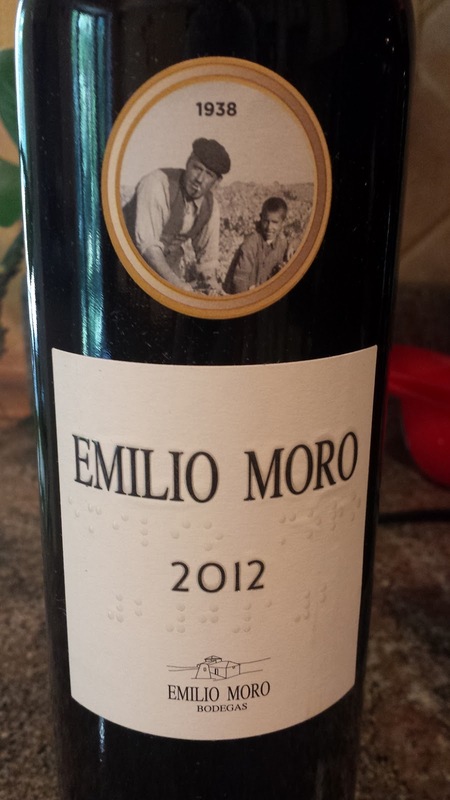 Emilio Moro 2012 ($24.99, %) - 100% Tinto Fino (Tempranillo); composed of grapes from a selection of mid-aged vineyards (15 to 25 years) representing their most important soil types. 50% of the grapes were harvested from vines planted in chalk soil, then aged 12 months in French oak; whereas the other 50% was harvested from vines planted in clay soil and then aged 12 months in American oak. Moro noted that the French oak - chalk soil combination provides finesse and the American oak - clay soil provides more structure. The result is dark fruit - blackberries - more spice and leather on the palate; but silky texture and rich tannins & acids; a solid, complex and enjoyable wine. 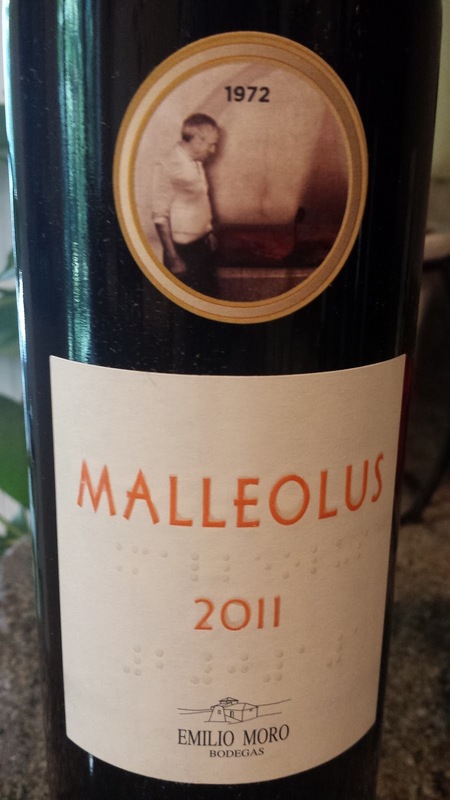 Malleolus 2011 ($44.99, %) - 100% Tinto Fino (Tempranillo); Malleolus translates from Latin as majuelo, which is the name used in Pesquera de Duero for a small vineyard. This wine is an expression of the oldest vines (25 and 75 years old) and aged 18 months in 500 liter French oak barrels. This is an intense wine, both earthy and fruity (black fruit - dried cherries) with spices, leather, and chewy tannins. Simply fantastic. This week New Zealand's, Villa Marie Estate Winery hosted a #NZSauvBlanc twitter tasting focusing on two of the winery's Sauvignon Blanc. And why not, their Marlborough vineyards are in the perfect location for this grape with low rainfall and New Zealand's sunniest region at 2,435 hours of sunshine. 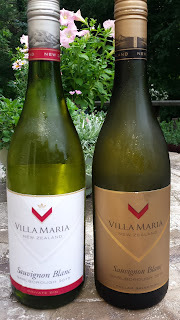 This northern part of the South Island knows Sauvignon Blanc and it shows with these wines; both excellent and affordable options. 2015 Private Bin Sauvignon Blanc ($14.99, 13.0%) - powerful, I'll repeat, powerful apricot - citrus aroma; creamy citrus palate; finishes with effervescence. 2014 Cellar Selection Sauvignon Blanc ($19.99, 13.0%) - more subtle aroma; followed by explosion on the palate or lemon - apricots; solid acids. 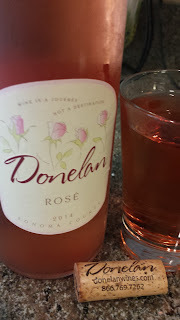 The third week of the Protocol #WineStudio Rosé series features more Sonoma County rosé, this time from Donelan Family Wines in the 2014 Rosé Sonoma County Syrah / Grenache / Pinot Noir ($25, 13.3%). Now, we all enjoy a nice GSM wine, but a GSP? This shall be interesting. But first, Donelan winemaker Joe Nielson answered our questions regarding the wine's production. It is made using the Saignee method, where the grapes are loaded into tanks and juice is pulled after short skin contact of 1 hr to 24 hrs. The extracted juice represents 5% to 20% of total volume as it serves a dual purpose of making the red wine, from the remaining juice, more concentrated and allowing for the production of a second wine - a rosé. The exact percentages in the blend is 55% Syrah, 29% Grenache and 16% Pinot Noir, with all juice fermented in neutral oak - similar to fermenting Chardonnay. Nielson believes prefers neutral oak over concrete/stainless steel because "it helps with micro-ox which keeps #rhone wine from stinkin'". The grapes were harvested across multiple Sonoma County vineyards with the lots interestingly named #babs #direstraits #DavidLeeRoth #Prince #BonJovi - all #terroir driven personality. The one exception to the saignee juice came from the #Prince lot from Bennett Valley, which was lightly pressed. The result is a wine where the acids comes alive providing a clear contrast to the creamy center and tropical nose. Mango and pineapple comprise those tropical attributes; the neutral oak rounds out the finish and contributes that creamy palate. The acids are key though, helped along by the Syrah harvested from the cooler Russian River Valley Walker Vine Hill and Kobler vineyards. This is a solid wine, one to savor. Well done. Cheers. Oregon's Willamette Valley is the Beaver State's most dynamic, and probably, most diverse winegrowing region. Most are familiar with the extensive Pinot Noir plantings, but there's also a fair amount of Pinot Gris, Pinot Blanc, and Chardonnay. The AVA stretches from the Columbia River in the north to just south of Eugene in the south along the Willamette River. Thus many of the lower vineyards consist of sandy loess soils, whereas higher elevations are volcanic and even marine sediment. The Willamette Valley AVA has been subdivided into sub-AVAs: Dundee Hills AVA, Eola-Amity Hills AVA, McMinnville AVA, Chehalem Mountains AVA, Ribbon Ridge AVA, and the Yamhill-Carlton District AVA. I recently received a care package of four wines from the popular brand, Kudos Wine. Produced by NW Wine Company, a custom wine crush facility, this brand encompasses single vineyard, sub-AVA, and Willamette Valley fruit. "Under the supervision of owner and executive winemaker Laurent Montalieu, NW Wine Company works with vineyard owners ranging from 1 acre to 200 acres in the Willamette Valley, Oregon, and beyond. As an incubator for small wineries and vineyards, NW Wine Company allows producers to focus on creating a quality vineyard and wine prior to investing in a production facility of their own." 2013 Willamette Valley Pinot Noir ($15, 13.1%) - herbal black fruit, light, smooth finish; another on the pleasant side. 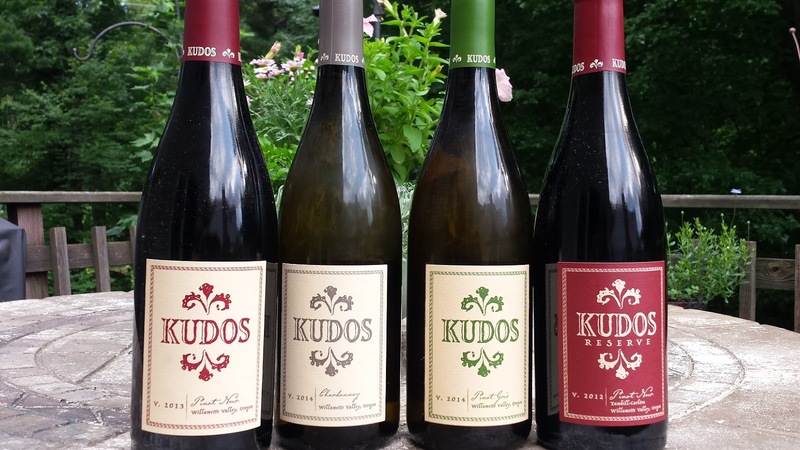 2012 Kudos Pinot Noir Reserve Yamhill-Carlton District ($20, 14.3%) - subtle cherry and chewy peppery palate, easy tannins; the best of the bunch - seek this out. 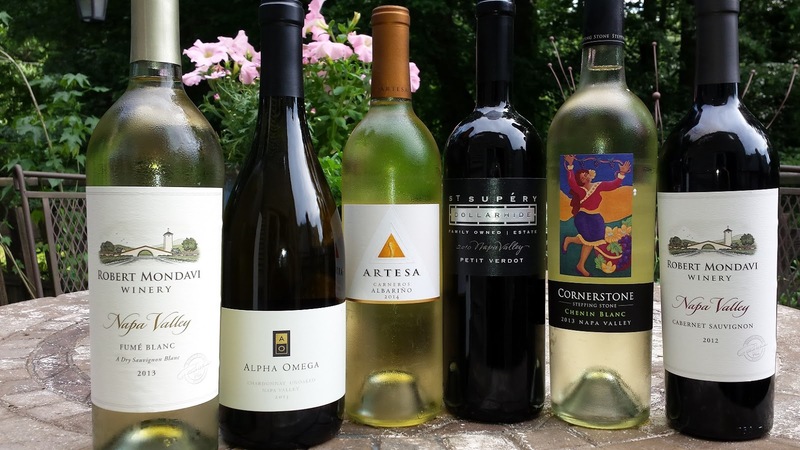 This week Karen MacNeil, of the Wine Bible fame and Keynote Speaker at the upcoming 2015 Wine Bloggers Conference, hosted a twitter tasting (#SipWithKaren) featuring six "unexpected" Napa Valley wines. The event was sponsored by Napa Valley Vintners and included Bottlenotes and The Daily Sip, in which MacNeil is the Editor-in-Chief. The tasting was heavy on whites with an Albariño, a Chenin Blanc, an unoaked Chardonnay, a Sauvignon Blanc; and for the reds and Cabernet Sauvignon, and 100% Petit Verdot. I know what you are thinking, what so unexpected about a Napa Cab. I had the same question. Besides tasting the wines, the most informative part of the program was the tweets regarding Napa Valley by our sponsored host. I was generally aware of some of these facts; others, not so much. #NapaValley was designated California’s first American Viticultural Area or AVA in 1981. Within #Napa can be found half the world’s soil orders..
Did you know that only 9% of #NapaValley is planted to grapevines? Did you know #Napa’s To Kalon Vineyard was planted in 1868 by HW Crabb? To Kalon is Greek for “highest beauty". Fun fact about Napa: over 60% of wineries produce less than 5k cases per year. Did you know #NapaValley has about 1/6th the planted grapevine acreage of #Bordeaux? #SauvBlanc is the fourth most widely-produced wine grape variety in #Napa. #Chardonnay is #Napa’s 2nd most widely planted wine grape (behind #cabernet) - 6,900 acres/30,500 tons in 2014. 2014 Artesa Napa Valley Albariño ($28, 14.2%) - fermented and aged 5 months in stainless steel (85%) and new french oak barrels (15%). Starts with peach, then pineapple-lemon, then honeysuckle, with a long acidic finis. Karen MacNeil: This #albariño from @Artesa is easy to love. It’s a perfect #apéritif & great way to start the flight. 2013 Cornerstone Cellars Napa Valley (Oak Knoll District ) Chenin Blanc ($25, 15.5%) - white fruit aroma; citrus, velvety texture, and mineral palate; finishes with plenty of acid. Karen MacNeil: Not as full bodied as #chardonnay, but not as light bodied as #pinot grigio. This #chenin is right in the middle & I love the crisp finish on this @CornerstoneNapa #cheninblanc #EasyToDrink. 2013 Robert Mondavi Winery Napa Valley Fumé Blanc ($17, 15.5%): Napa Valley – 89% (61% Wappo Hill Vineyard, 20% To Kalon Vineyard); Mendocino County - 11%. Starts with lemon grass, but palate is deeper with minerals and finishes strong & long in acids. Karen MacNeil: This @RobertMondavi Fumé Blanc has beautiful focus and a lovely salinity. Long flavors of spice and bitter citrus. 2013 Alpha Omega Unoaked Napa Valley Chardonnay ($33) - sees no ML or oak, but spent 6 months “sur lie,” which contributes to it’s creamy texture and and allows apple-tangerine-citrus notes to shine through. Karen MacNeil: I like the @AOwinery “Unoaked” #Chardonnay a lot. It’s a wine that’s effortless to drink all day long. 2012 Robert Mondavi Napa Valley Cabernet Sauvignon ($29, 15.5%): 88% Cabernet Sauvignon, 6% Cabernet Franc, 4% Merlot, 1% Petit Verdot, 1% Malbec. Blackberries prevalent throughout; herbaceous and textured, some chocolate, long soft finish. Karen MacNeil: This @RobertMondavi #cabernet offers a tremendous value. Each glass would only cost you the equivalent of a Starbucks latté. 97% Petit Verdot, 3% Cabernet Sauvignon; 100% French oak (50% new oak), 20 month. Big dark fruit, spices, chocolate, lingering barnyard notes - envelop the mouth. Karen MacNeil: This @StSupery #petitverdot is very focused and precise. There’s no static – it sings its song exactly. 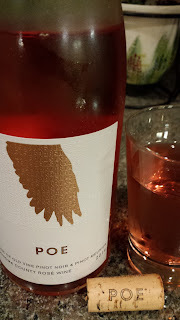 The Protocol #WineStudio Rosé series continued this week by featuring the POE 2014 Sonoma County Old Vine Pinot Noir / Pinot Meunier Rosé ($22, 12%). This unique winery was founded in 2009 by Samantha Sheehan, who wanted to create a wine brand that would showcase the distinct terrior of single vineyards in California. And the name comes from her affection for the famous writer and poet - as portrayed by the wine's label. The rosé is a curious blend of 66% Pinot Noir from Olcese Vineyard and 34% Pinot Meunier from Sonoma Mountain's Van der Kamp Vineyard. The two pinots were specifically selected to mimic Burgundy and Champagne with the Pinot Noir providing "nuance+depth" and the Pinot Meunier providing "fruit+form". Old Vine is appropriate since the Pinot Noir was planted in 1974 and the Pinot Meunier in 1953. She also specifically targeted the Van der Kamp vines and fortunately a few rows became available after her inquiries. Sheehan told the #winestudio participants that the grapes were harvested early, as in Champagne, to provide bright acids and low alcohols. The grapes were slightly pressed (no saignée) and treated the fermenting juice as a white wine - with cold fermentation and no malolacatic fermentation. For me, the wine opens with raspberry that transitions to a juicy and chewy citrus flavor. Sheehan also hinted at the orange peel and orange blossom characters. The wine finishes long and acidic. Another fabulous dry rosé; give the wine a try and decipher the label. Cheers. June's #WineStudio concentrates on dry rosé and features several wines from regions and grapes you'd normally not associate with the style. 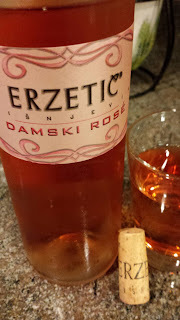 Case in point, the Erzetič Damski Rosé ($24, 12.5%) produced from Merlot grapes in Slovenia and imported by Old World Vines. The Erzetič Winery is located in the Goriska Brda region, which is part of the larger Primorska wine region. Goriska Brda borders Italy and shares many traits with its Italian neighbors - particularly the predominance of red wines. Although the local white Ribbola would beg to differ. Wine making in the area can be traced back to the 13th century, with the Erzetič property growing grapes since 1725. The vineyards are slightly elevated on rolling hills providing adequate ventilation and the soil is composed of ancient seabed matte. Erzetič is a family business with knowledge passed to each generation; currently Aleksij Erzetič is the winemaker. Interestingly, Erzetič is one of only two wineries in Slovenia making wine from Georgian amphora vases. Cheers to orange wine; but now to the pink wine. The Damski (Ladies) Rosé is 100% Merlot harvested from estate fruit. The grapes were gently pressed until the desired color, texture, and tannin extraction was reached; fermented occurred in stainless steel.The result is a salmon pink colored wine, with noticeable acidity. Raspberries are prevalent on the nose, but the most impressive feature is the creamy mid-palate where the wine melts into the acids. Quite nice; definitely the best Slovenian Merlot rosé I've ever had. Cheers to that and to next week's WineStudio rosé . At next year's SAVOR event I need to attend both evenings as I determined one night is not enough time to visit with all the breweries - particularly if you attend a salon. This year it seems that I only had time for about half the beer selections for a variety of reasons. First, I spent an hour in the Grape and Grain salon hearing Sam Calagione of Dogfish Head Craft Brewery and Dan Kopman of Schlafly Brewery describe their respective brewery's ventures combining fermented grain with grape must. 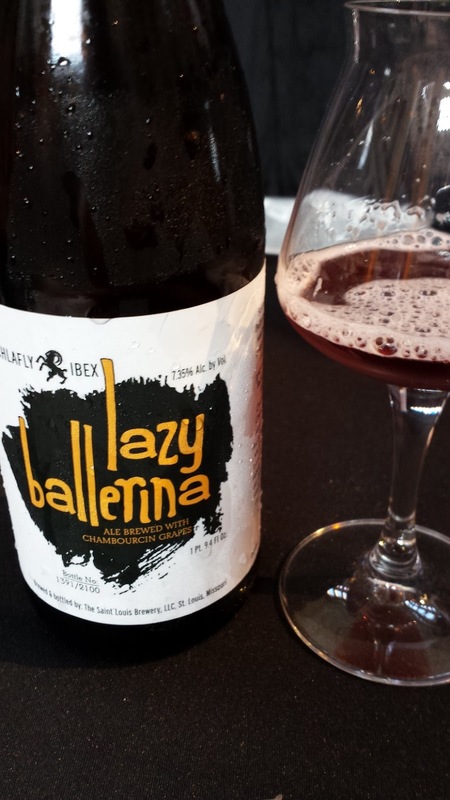 I was particularly attracted to Schlafly's two versions of Lazy Ballerina, both made from a barley and wheat mash plus Chambourcin grape must from Chandler Hill Vineyards. The difference between the two was that the grape must in the bottled version (which was the one poured to the SAVOR participants) was inoculated with Saison yeast whereas the second was fermented with wild yeast and bacteria - which the brewery determined was 2 types of Brettanomyces and one type of Lactobacillus. They've retained these cultures for future fermentations. That's a wise decision, since that version of the Lazy Ballerina was fantastic - funky with a little cream. On the Dogfish Head side, Sam poured samples of their 61 (the 60 Minute plus 20% Syrah) and Chateau Jiahu - a fermented beverage made from orange blossom honey, muscat grape juice, barley malt and hawthorn fruit based on pottery residue found in Jiahu China. Both of these are tasty in their own right. The second reason I missed many of the breweries is that I was determined to sample all the sour and fruit beers presented. 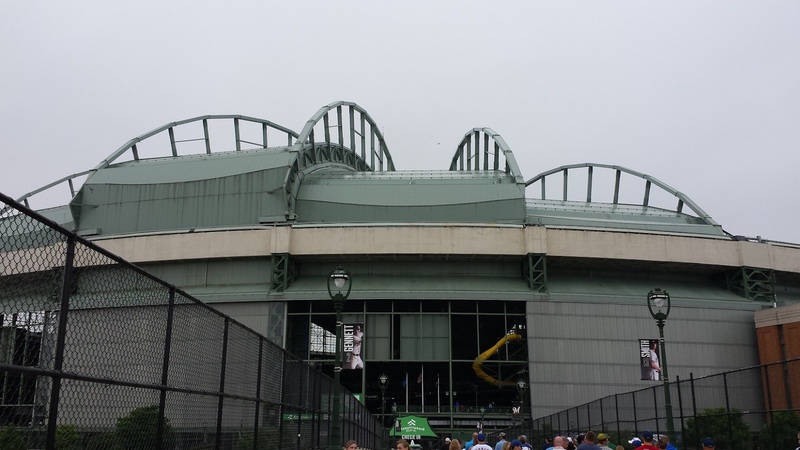 There were close to twenty ranging from Kreiks to Gose to Wild Sours. And straight up, Upland Brewing Company (Bloomington, IN) poured two of my favorites; the VinoSynth Red and the Dantalion. The first is a red and white collaboration with Oliver Winery a blend of 50% Sour Reserve and 50% Malefactor Flanders-style Red Ale aged on Catawba grapes. The jamminess of the Catawba was balanced with the acids of the red ale to create a fine funky beer. The Dantalion is based on the Flanders Oud Bruin (Brown) beer style where the brewery's base lampic is aged in white oak barrels for at least eight months. There's plenty going on in this beer with multiple spices, chocolate, and rye characters mingle throughout. Well done. There were several other sours worth noting. 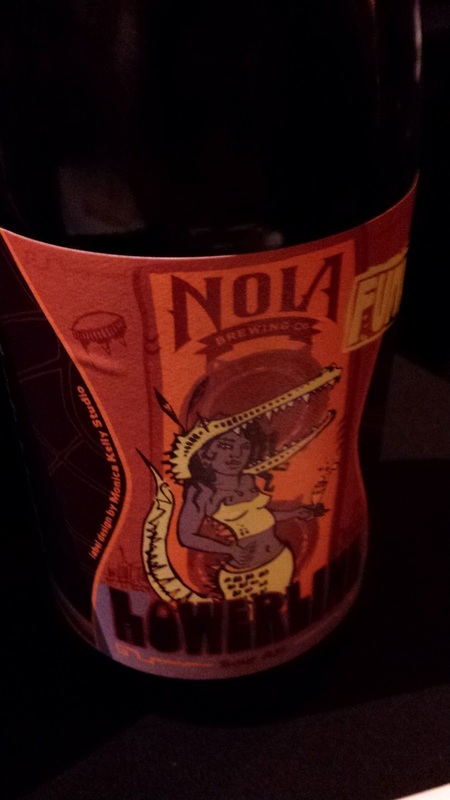 The NOLA Brewing Lowerline is part of the brewery's Funk series. This beer was inoculated with a lactos bacteria providing a tart and very creamy flavor. There's not a lot of complexity here, but the beer is very pleasant. Locally based Mad Fox Brewing Company was pouring their Oaked Diabolik which was rich and creamy with a wine like texture. 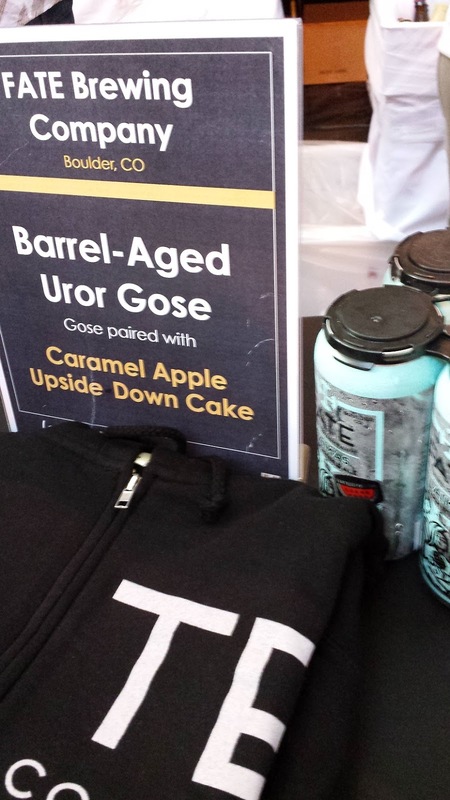 Boulder's FATE Brewing Company offered a popular Barrel-Aged Uror Gose, which was aged 10 weeks in used Arta tequila barrels. The agava flavors blend seamlessly into the tart and salty brew. Nashville's Yazoo Brewing Company Embrace the Funk Series Deux Rouges is their Flanders ale, fermenting with wild yeasts and souring bacteria, aged in used Merlot barrels. This process imparts some spiciness into the sour and mellows the finish nicely. 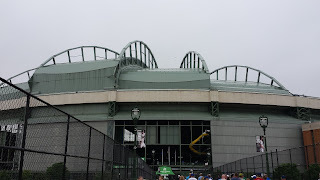 Milwaukee's Brenner Brewing Company Maiden Opus was quite solid (as was their Bacon Bomb Rauchbier). And Austin's Hops and Grain Brewing Volumes of Funk: Sour PorterCulture is a mash bill close to their Baltic porter recipe and then aged in barrels full of brett and lactos. Pretty tasty. Two final beers to note are the Strange Craft Beer Company Cherry Kriek and the Schlafly Brewery Apricot Berliner Weisse. The Schlafy beer was bright, acidic, with subtle apricots which I could quaff all day. The Kriek is a World Cup Gold Award Winner and showcases a slightly tart and sweet flavor profile. Probably can't drink more than a couple, but it's an interesting beer to sample. Getting back to missing out sampling all the beers is that that many breweries ran out of supplies way too quickly. Funky Buddha Brewery was done an hour into the event; Country Boy Brewing not long afterwards. And there were many other early exists. 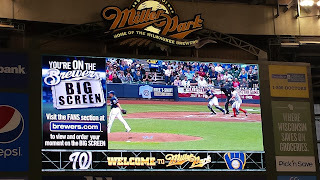 That was the major disappointment of the evening; I know many of the offerings were limited productions but the Brewers Association may need to require breweries to pour a beer with more inventory. 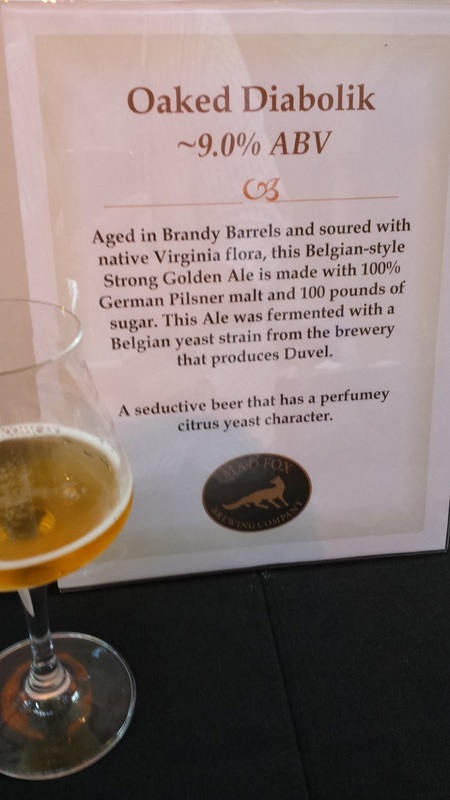 Otherwise, SAVOR was another extraordinary craft beer tasting. Cheers. 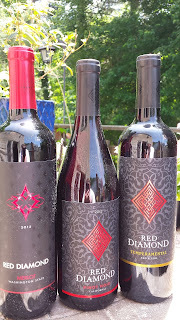 Along with the Columbia Crest samples, I received three wines from fellow H3 winery Red Diamond Winery, all priced in the $10 value range.The Merlot was sourced from Washington State fruit, whereas the Pinot Noir consists of California grown grapes and the Temperamental several grapes imported from Spain. And all three are priced to appeal to most wine consumers. Red Diamond 2012 Merlot ($10, 13.5%) is a 90% Merlot, 10% Syrah blend of grapes harvested from eastern Washington state. The wine was aged 12 months in French and American oak barrels. The Merlot starts with subtle earthiness and spice on the nose, moves on to a dusty and blackberry - dark cherry flavor, and finishes easy with decent acids and lingering spices. Very nice. Red Diamond 2012 California Pinot Noir ($10, 13.5%) is a blend of 80% Pinot Noir, 10% Petit Sirah, and 10% Petit Verdot. That's an interesting combination and interestingly the wine starts with a peppered spearmint aroma. The cherry flavors evaporate quite rapidly as the wine races to a smooth finish. Prefer others. Red Diamond Temperamental ($10, 13.5%) is a blend of 90% Tempranillo, 4% Graciano, 3% Garnacha, and 3% Mazueloall imported from Spain. This was easily my favorite wine of the trio, with chocolate cherries on the nose, followed by a slightly elevated blackberry middle, and finishing very smooth. 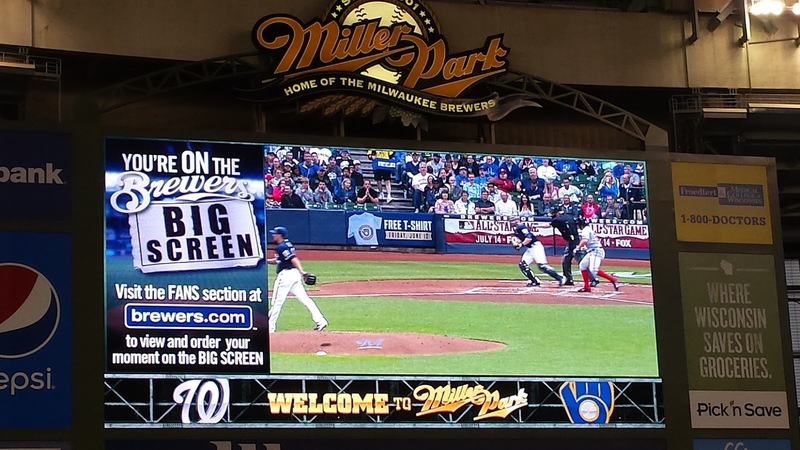 At ten bucks, this is quite a deal. Cheers. 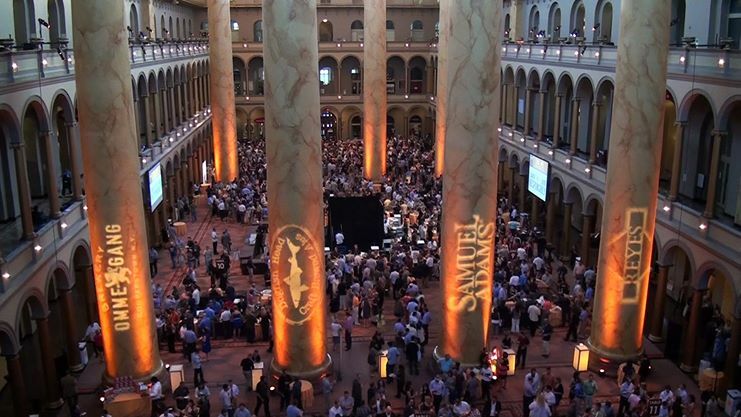 Hopefully everyone who plans to attend SAVOR this weekend has already previewed the beer selections. 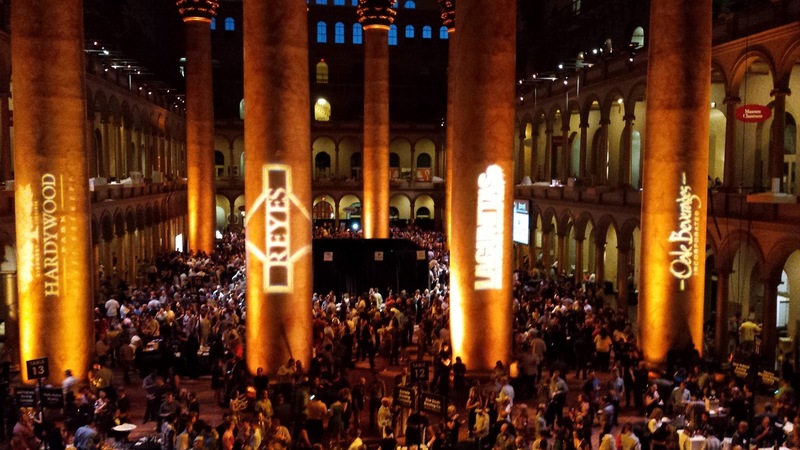 If you're not familiar with the event, it is beer paradise organized by the Brewer's Association and featuring over 70 craft breweries from across the United States - each pouring two beers. Once again, the event is being held at The National Building Museum in Washington DC. In the past the breweries have focused on the public's thirst for IPAs and dark beers nad this year is no exception with about 36 versions of an IPA plus 24 Stouts and Porters. However, I find more appealing the almost 30 offerings of Belgium styled ales as well as 17 sours. Here are the beers and breweries I plan to concentrate on during the evening starting with the FATE Brewing Company - Boulder, CO; Barrel-Aged Uror Gose. 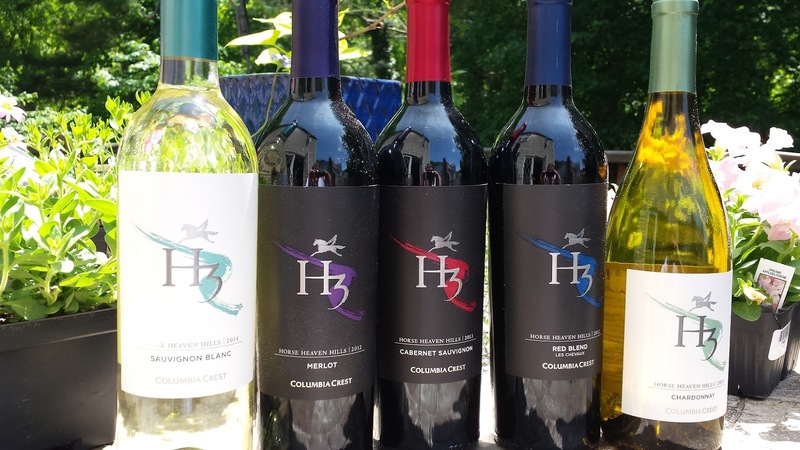 It was a joyous household in May after receiving a package of H3 wines from Columbia Crest Winery, the largest producer in Washington State's Horse Heaven Hills AVA. The viticultural area was cut out of the larger Columbia Valley AVA in 2005 and consists of half a dozen wineries.The region is unique in that the hills face south, providing plenty of sunshine and airflow - 30% more wine patterns than other areas of the Columbia Valley. Temperatures are hot with little rainfall (9 inches annually) as the 14,000 foot peaks of the Cascade Mountain range block moisture from the Pacific. According to local historical records in 1857 rancher James Kinney was camping in the range of hills in south-central Washington. When he woke up to discover his herd had wandered up a mountainside and into an upland plain where they were munching on succulent bunch grass. “Surely this is Horse Heaven,” Kinney commented. The area has been known as the Horse Heaven Hills ever since. Columbia Crest has been operating for 25 years and maintains 2,500 out of the 6,040 acres of vines in the AVA. The soil in these vineyards are primarily sandy and silt loam with the vineyard's height ranging from 200 to 1,800 feet. In 2003 Juan Muñoz-Oca joined the Columbia Crest team with a pedigree of working his grandfather's Bodegas Toso winery in Mendoza, Argentina. In 2011 he became winemaker after spending the preceding years enhancing the winery's red wine program. Their H3 brand are affordable wines intended to "express the appellation’s terroir". 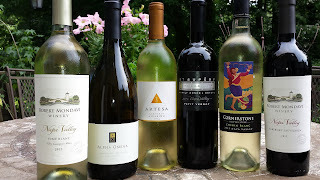 In general, the five wines I tasted were very approachable and mostly true to style. H3 2014 Sauvignon Blanc ($15, 13.0%) - with 1% Semillon. Whereas there is plenty of lemon citrus, the mineral aspects were as prevalent as the acids. Very nice. H3 2013 Chardonnay ($15, 13.5%) - a very complex Chardonnay resulting from various oak treatment, several yeast strains, and 70% undergoing malolactic conversion. The aroma starts with plenty of pears but the fruit gives way to a toasted buttery character that remains through the finish. Not my style of Chardonnay, but for those who prefer an oaked Chardonnay - give it a try. H3 2012 Merlot ($15, 14.5%) - a very different Merlot, with 4% Cabernet, extended maceration on the skins and varying oak aging. There is a dominant spicy character that mingles with blackberry and dark cherry flavors. This is not your fruit bomb Merlot. H3 2013 Cabernet Sauvignon ($15, 14.5%) - blended with 1% Cabernet Franc with various oak treatments; this was my favorite of the group. It starts with a loads of dark fruit on the nose, transitioning to subtle vanilla and earthy leather. The finish is very approachable, with a slight layer of chocolate and berries. H3 2012 Les Chevaux Red Blend ($15, 14.5%) -a blend of 60% Syrah, 27% Merlot, 4% Cabernet Franc, 4% Viognier, 2% Malbec, 3% Other Varietals. The Horses is another excellent wine where the fruit is allowed to express itself with some silky texture and a bright finish. Love the Rhone dominant aspect of this wine.